The map above will take you directly to the Black Moshannon State Park Office. The Environmental Learning Center is directly across the lake from the swimming area. Please review the Black Moshannon Snowmobile Trail Map for available parking lot locations. Snowmobile trails/roads are accessible for all noted parking lots on the map. Harpster Canopies of Philipsburg – This business is located on the Airport Road. The Airport Road is approximately 1 mile from the Black Moshannon State Park on Route 504. A map to the business is below. Click here for driving directions to this business park lot. Please note that this parking lot is only available for the poker run and is not open to snowmobilers any other time. Equestrian Parking Lot – To access this parking lot from the Black Moshannon State Park Office, follow the Beaver Road and pass the park office until you come to Route 504 intersection. Turn right onto Route 504 and go up the hill. Continue on Route 504. Shortly after passing the fire tower (on left), turn left onto Benner Run Road. The equestrian parking lot will be less than a 1/4 mile on the left. 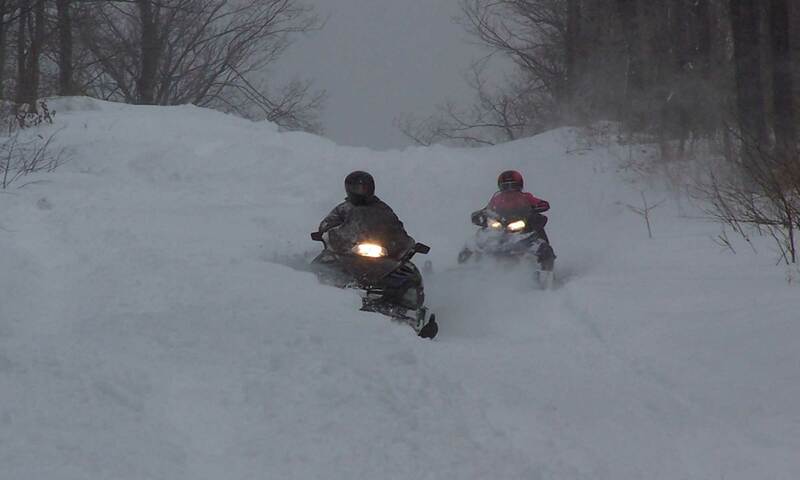 This short section of Benner Run Road is always cleared (but rideable) and shared with snowmobiles. It will be accessible for snowmobile truck & trailer parking. This parking lot is open to snowmobilers all season. While this parking lot is not noted on the trail map, please refer to the Black Moshannon Snowmobile Trail Map to get you pointed in the right direction.